The shop was established in the last century (just!). We pride ourselves on the quality of our goods. Cheeses are sourced from the very best Affinuers, namely Hervé Mons from France and Neals Yard Dairy of London. Some come direct from the farm, but all are sold in the very best of condition to arrive to you within 24 hours of departure ready to be consumed. 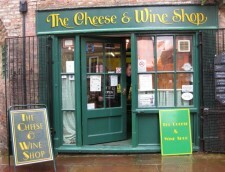 The wines, beers, biscuits, chutneys etc have been selected to accompany the cheeses of your choice. Our goods do the selling. For anything special, please call us. I will answer the phone if not serving customers. Please be patient. Our telephone number for enquiries is 01325 384803.